Thriller in Sochi How do they keep doing it? With two one-goal comebacks in the third period, the United States fought back and forced overtime before coming through in the shootout to win 4-3 against Russia. Canada going for gold Canada will compete in the 2013 IIHF U18 World Championship gold medal game after defeating Finland 3-1 during the first semi-final in Sochi. Valeri Nichushkin profile The captain of the Russian junior team, Valeri Nichushkin, has had a busy few months, making a seamless jump from the MHL to become a top player for Traktor Chelyabinsk in the KHL at only 18. Slovakia remains in top division Latvia has been relegated to Division I Group A following a 3-2 loss to Slovakia in the second game of the relegation round. Denmark will take Latvia's place at the 2014 U18 World Championship. Semi-final preview Friday afternoon, Canada will take on Finland, while in the evening game Russia will go up against defending champions United States. IIHF.com has a short preview of both games. 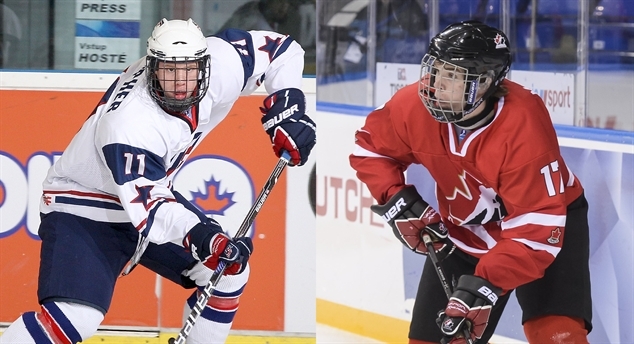 Making the show For players eligible for the National Hockey League Draft, The U18 World Championship is the final chance for them to show off their skills and raise their stock in the eyes of NHL teams.